Thanks to everyone who came to the Pin Ups Ladies Night 2 on Friday, a quite staggering turn out and I hope everybody enjoyed themselves. If you're after similar hilarity we have another event this Friday - HEAVYLIGHT DARKBRIGHT - which will be a bit less "girly-wirly" (technical term) but hopefully just as entertaining! 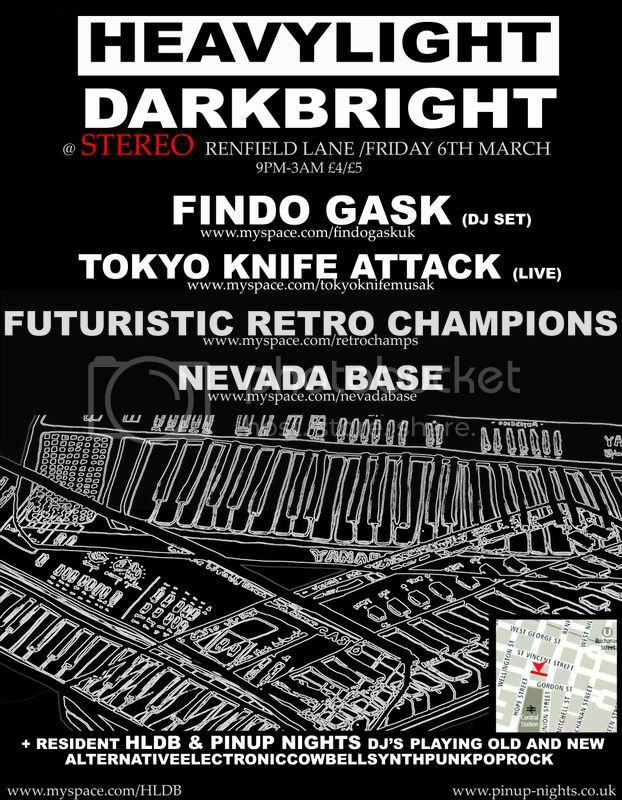 Playing live are TOKYO KNIFE ATTACK ( www.myspace.com/tokyoknifemusak - "his storming live set of italo/electro-funk is becoming a stuff of legend" - Huntleys and Palmers Audio Club ), FUTURISTIC RETRO CHAMPIONS ( www.myspace.com/retrochamps - "Originally started as an 'art college project' they have sprouted arms, legs, wonky keyboards and a barrowload of bona fide electro-indie-pop crackers over the last year" - The List ) and NEVADA BASE( www.myspace.com/nevadabase - "rhythmic electronic pop in the mould of Metronomy and Hot Chip" - The List ) as well as a DJ set from Glasgow's own superstars in the making FINDO GASK ( www.myspace.com/findogaskuk - "phrases used in connection with FG's brand of electronic heartache are "astonishing", "absolutely brilliant" and "staggeringly good" " - The Guardian ) and of course the HLDB and Pin Ups DJs. Heavylight Darkbright won’t be on the same night every week or month...It will be when the time is right and we can provide you with something a bit different.